A Brother's Tribute and Heroes Remembered! Then there was Stan, Willie, Ted and the likes which were are heroes...Gentlemen baseball players were they all. Remembrance of their smiling faces and comical antics flash vividly through my mind as a fond recall of these baseball greats remembered. How they graced their respective teams with style of Baseball Guts and Glory with a commitment to the game while most, if not all, have gone on to play on that unmatchable diamond in the sky- Oh how I would love to see these baseball immortals at play once more. To see "The Mick," swing the bat just one more time..driving the ball deep into the "upper deck," grandstands...bringing his teams cheering fans to their feet in jubilation. These are only a few of the wonderful baseball from our younger days. To witness "say hey" Willie Mays, gracefully run under a high outfield fly ball and at the last second, drop his glove to belt-high level, bringing in the ball in his patented basket-catch style. "Stan The Man" Musial and "The Splendid Splinter," Ted Williams working their magic with a 35 ounce, funnel-shaped, tapered piece of hickory wood. All of these baseball memories are grand and most wonderful to recall, but my most vivid recollections and memories of the game ..that instilled within me a love for the game were the sandlot games played on the old Hewitt High Baseball Diamond, by a group of boys from several surrounding communities. These are great baseball memories. The ballplayers coming from Trussville our town, Clay, Happy Hollow and the like, would gather there on a Sunday afternoon to play the game. I remember their hustle and commitment to win, as if there was a packed grandstand filled with cheering fans. But normally the fans were few, but did these boys "give a rip?" No way Jose Canseco! These boys came to play not for recognition, not the fame and especially not for pay. These boys met on the sandlot on a Sunday afternoon, for years one thing bringing them together, that being their love for the game of baseball. These boys came to play and ball playing brothers formed a bond between them becoming a baseball players most loyal fan. I remember the play of one talented player especially, a left handed hitter with an exceptional eye for the ball. Getting on base and driving in runs were his forte'..equipped with a rifle right arm and cat-like quickness he could "scoop and shoot" with the best of infielders. My brother, Brownee, played with enthusiasm and talent ...his hustle and demeanor on the field have never been matched in my mind!. When I watched him play I knew without a doubt that I wanted to be a competitor as he. Bro. Brownee may not have stood in pro baseball's limelight, but this I want to share with you..Bro. Brownee is a winner in life, always has been, always will be. ...to accept victory graciously and to "Hang Tough" in defeat. Bro. Brownee was a scholar of the sport, sharing fundamentals of the game to those who cared to know more ..believing that by perfecting the fundamentals you gain the winning edge. I find it hard to comprehend what my life would have been if Bro. Brownee, in his unique and wonderful style, had not instilled within me the desire to compete, to challenge my foe, and win the victory...and foremost, I want to give Bro. Brownee the credit for introducing me to the wonderful game of baseball and these great baseball memories. 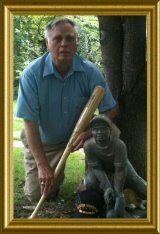 Yes..this baseball memory recalls ball playing Babe as one of our baseball playing and baseball playground youngsters growing up together. Forever remembering These cherished memories as provided are courtesy of my younger brother Bailey, not only do they bring back fond memories of the game of baseball, it also brought a tear to my eye due to his glowing tribute to "me" his older brother. Playing the game we have loved is like only onto a dream as in baseball dreams did we really get to enjoy growing up and the game of baseball so dearly? You will also enjoy his reminiscence of Trussville Little League and experience of "A Small Town Boy" as he talks of his home town. I had to share this with you all, along with many other stories I'll be passing along from Bailey, as time goes by...because when Bailey talks baseball diamond stories, It will pay dividends to listen! One other thought that I must share and that is that Bailey has always been partial and true fan of those Yankees so when I chose to identify "The Splendid Splinter" as baseballs greatest hitter but my choice over the legendary Honus Wagner "The Flying Dutchman" of the Pittsburgh Pirates and the great "Georgia Peach" Ty Cobb of the Detroit Tigers was a tough call and it made me pause. When choosing and announcing The Greatest Hitter without mentioning Babe Ruth, Joe DiMaggio, Roger Hornsby, Lou Gehrig and Mickey Mantle of the mighty Yankees could be akin to heresy. Those baseball playing youngsters of my sandlot days are now part of the Old Timers Baseball and Baseballs Over The Hill Gang. Once we could jump a picket fence and run like a deer now we need a new landing gear. But it sure brings back some fond baseball memories. Baseball playing is the fun part and the non formal piece of our education journey therefore all of our baseball players should continue right on through to the completion of our education needs right on through our college degree years. A tremendous wealth of information and knowledge is available for you to pursue the skills needed to claim your further adventure in sports via the attainment of a College Scholarship.